"US sales slipped again as it faced 'ongoing broad-based challenges in May (while) an increase in global sales in its Asia, Middle East and Africa region was driven by strength in China and other Asian markets"
Frustrated with slow domestic sales many companies are finding growth in global markets. But others, overwhelmed with routine business hassles or intimidated by common myths around risks of exporting, simply "hunker down." 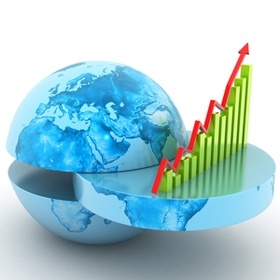 One of the common assumptions among SMBs is that they lack scale for global sales. Try telling that to Wheeling, WV's Wheeling Truck Center. One of this years "Presidential 'E' Award" winners for global sales growth, Wheeling Truck Centers is a family owned company founded in 1933 and now run by two grandsons of the founder. They sell new and used truck parts for Volvo trucks. It's not magical. First there's a decision to grow globally. Then there's an ongoing effort which is sensibly directed through strategic focus (not just helter skelter 'international' activities.) But it doesn't happen by accident. Companies that succeed embrace the challenge. While they recognize that they will face new and different hurdles they simultaneously acknowledge that different doesn't mean riskier. It simply means.....different. And most companies that succeed in global sales growth (without investing in an expensive and extensive corporate footprint on the ground in many markets) share a common tactic. They leverage digital tools. Inbound marketing provides a remarkable platform to help buyers from around the world find your products. But it's about more than just having a website. Is your digital marketing helping qualified international buyers find you? Is it even optimized to drive domestic growth? This tool is an amazing equalizer for companies that use it. But in the meantime, wondering if it's the right time to explore exporting for your business? Check out our free eBook.